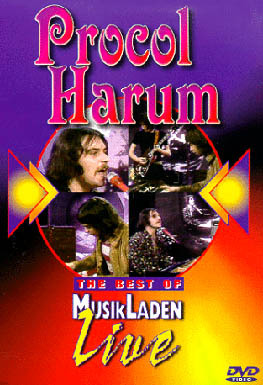 Procol Harum did quite a lot of television appearances in Germany … read this page for details. As well as circulating informally for many years, they have at last seen legitimate release, as this page shows … there are numerous interesting links to follow too. Thanks to Per Hermansen and Alick Leslie for this information. The disc commemorates the well-known 'Beat Club' recording made in Germany in 1971, but the cover picture is of the momentarily-reformed Harum in 1977 featuring Tim Renwick on guitar: more pictures and story may be read here. This item was re.issued october 2002. Led by pianist / singer Gary Brooker, this 1971 Beat Club Workshop showcases the band at the height of their career. The show features BJ Wilson on drums, Chris Chopping [sic] on organ, Dave Ball on guitar, Allan [sic] Cartwright on bass, and Gary Brooker on piano and vocals. Two bonus tracks, Drunk Again and Grand Hotel, were added from a 1974 appearance. 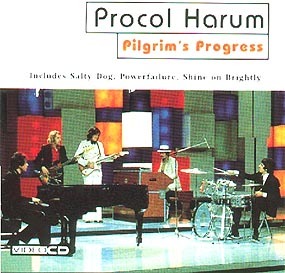 This is Procol Harum at their best and a must for any Procol Harum fan. 45 minutes. Superb musicianship and artistry come blazing through in these rare and exciting performances of artists and groups of the 60s, 70s, and 80s. These are the international stars that were part of the televised monthly music show Beat Club and MusikLaden. Filmed in Germany at the television studios of Radio Bremen, MusikLaden (originally known as Beat Club) became a TV classic not only for the fans, but also for the artists who took part. There was no time limitation on song length [sic] so artists were able to perform live concert versions of their most popular hit songs. Review from Mojo, January 2001, p121: 'Vision On - Smoke on the Podium', by Richard Allen. I don't usually see the UK magazine Mojo as it's fearsomely expensive here as an import, but I was browsing through it at my local coffee shop / news-stand and came across a reference to Procol Harum with an associated picture of Chris Copping in a white suit (did he have more than one?) seated at a piano. The caption read "blah blah blah Matthew Fisher," or words to that effect. Thought you should know. And Mojo should certainly know better, as their editors seem to be dedicated to reliving the 60s. Did anyone else see the blurb about the Best of Musikladen Video in Mojo, January 01, p. 121? It was part of a page called "Vision On" -- 'orchestral rock and other pleasures ...' by Richard Allen. The first paragraph is about a recent Deep Purple gig with orchestra showing a large photo of same (Steve Morse on guitar). The next paragraph is a very complimentary brief review of Procol's 1971 Beat Workshop video, with "Gary Brooker, Matthew Fisher and all live in the studio..." accompanied by a small color photo just below Deep Purple -- of Chris Copping in a white suit, playing for some reason a white piano, with the caption "Procol Harum's Matthew Fisher." ?! This is just one of many over the years; most of the ones I've seen misidentify Gary as Procol's organist -- but there was another recent article from the UK (in the London Times I believe) which identified Matthew as the Procol guy who sang with the British Rock Symphony!. sheesh! It's a real shame that these mags can make such mistakes, and don't feel any obligation to print retractions/corrections when readers (like me and I'm sure others) inform them of their carelessness.